I live in Amherst. I can travel to Moncton, Truro, New Glasgow, Antigonish, Halifax and the Eastern shore of Nova Scotia. For further distances, feel free to contact me by e-mail or phone, we can discuss the details and go from there. My service is on a Reward Basis only if found. If the item is not found a $ 30 call out fee for fuel and vehicle expenses would be appreciated. Please note that my call out fee is subject to change depending on travel distance. Year round, dry and wet land, in the water up to 4 feet. If your lost item is on private property. Permission from the land owner is required. I have been metal detecting for over a year now, hunting beaches and parks mostly for lost rings and coins. It is wonderful to see a smiling face as someone is re-united with lost items. It mean something to them, that no one else will ever know the true value of. On July 10th I was visiting a beach in Prince Edward Island with my girlfriend when I felt my ring begin to loosen on my finger. In mere seconds, it went from my finger right to the bottom of the ocean floor. To anyone who has had a valuable lost under similar circumstances, it was the worst feeling in the world – I have never felt my heart sink so quickly. The water at the beach is very light under foot and it was as if the sand opened up and swallowed it whole. My girlfriend was quick to jump into action and we had 5-10 people out scouring the water for any sign of my lost ring but to no avail. We returned later that night with rakes and snorkels but optimism began to give way with every passing minute and the deteriorating conditions. I left on Wednesday to drive back to my family home in Nova Scotia with little hope of retrieval. 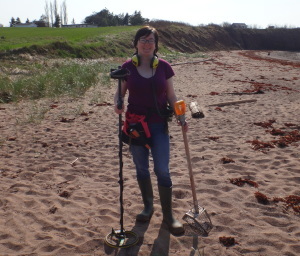 People had been mentioning the idea of using a metal detector so on Wednesday night I decided to at very least cover my bases and see what was out there. The first thing that came up on google was TheRingFinders website and upon entering in my geographical location only one listed member came up – Wanda Jewers. She was listed in Amherst – only an hour and a half from the PEI beach – so I sent her an email later that night. To make a long story shorter, I could not have asked for anyone better than Wanda and her boyfriend Kevin to aid me in my search! It was truly as if they were heaven sent. I received a quick response from Wanda and on just two days’ notice, they were happy to make the drive to PEI with their three metal detectors in tow to look for my ring. On Saturday, July 14th, exactly 4 days after losing my ring in the ocean, I received the greatest phone call in the world saying my ring had been found! 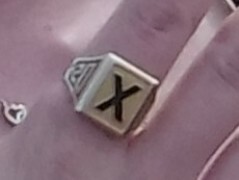 This was my university graduation ring, something I had just earned 7 months prior, and something that held a tremendous amount of sentimental value. Thank you to TheRingFinders website for running such a tremendous service (reading other people’s success stories kept me hoping and praying), and thank you to Wanda & Kevin for being the amazing people that you both are. It was truly refreshing dealing with such caring and good-natured people – beyond getting my ring back, I come away with a tremendous appreciation for the selflessness you have shown me!